Ethan Hawke and Uma Thurman star in GATTACA, a futuristic sci-fi flick set in a society of a genetically engineered population. Chris Watts (fx supervisor of MATILDA) supervised the subtly stunning visual effects for GATTACA. Like many of CONTACT's visual effects, the composites of GATTACA have a certain elegance about them, a quiet beauty that is difficult to express. The effects fit quite well around the film, which is an intelligent, engaging sci-fi flick that not only pleases the eye, but the mind, as well. The above shot is the first of a series of POV shots of the distant rocket launches. 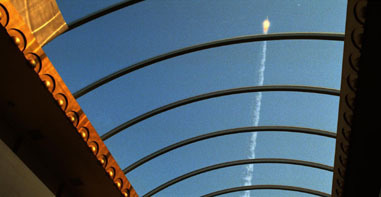 As Hawke watches from inside a building through a skylight, the rocket zooms off into space. In these POV shots, the rocket and its smoke trails were computer generated, modeled and animated by 3DSite. Among the film's 70 or so effects composites were numerous shots of a shuttle-type craft being launched from a distant site. Unlike the God's POV shots from APOLLO 13, all of the early shots are from Hawke's or Thurman's point of view. Watts told me that the wide shots were accomplished with computer generated models, "All the POV skylight rockets were VistaVision plates and CG rockets." Numerous different launch sequences were actually created, for different parts of the film, each with slight variations based on the time of day. "The launch sequences were modeled after actual jet and rocket trails. The animation was done by Dani Colajacomo and Chiara Perin of 3DSite. They used Prisms for the 3D work." Cinesite composited many of the rocket sequences' shots. The rendering of the rocket's smoke trails is quite realistic, and visually pleasing to the eye. Unfortunately, a few of the launch shots suffer from excessive digital noise patterns. Several fine tilt-up starscape shots were featured in the film, many of which featured a glimmering starfield. Numerous quality sky replacements were also created for the film. Other fine effects featured in the film include some wonderful glint enhancements in the solar farm sequence, as well as some cool, disorienting POV shots of Hawke's myopia; both effects were executied with 2D effects in Flame by Computer Film Company. The film ends with a dramatic launch with our hero in the cockpit. For these up close beauty shots, Hunter Gratzner Industries built the model miniature rockets, which were shot at The Chandler Group. Watts said, "There was a lot more shot than what ended up in the film - but [director Andrew Niccol] wanted the end sequence to be about Jerome [Hawke's character], not rocketry, so it ended up fairly simple." Its simplicity worked, since it would have been a bit extravagant and over the top to have produced a highly intricate, 30 shot effects sequence for this emotional finale.